INVINCIBLE diminishes from coarse to ultra-fine particles in a unique way and with absolutely no polishing dust. Use in conjunction with COSMIC 9H Sealant to achieve an incredible colour brilliance and an unprecedented lustre to your paintwork. By hand: Put a small amount of product on a suitable applicator and apply with light pressure using an over lapping circular motion. By machine: Depending on the paint defects we recommend a first pass with a medium cutting pad followed by a second pass with a finishing pad (polisher speeds up to 2000 - 2500 RPM). Buff off with a clean dry microfibre. 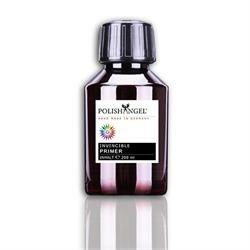 Polish Angel specialise in colour-matched and perfectly interlocking handmade automotive finishing systems. This exclusive and unique system is unmatched in quality and sustainability. Each colour pigment generated is called a special colour spectrum or light spectrum. Millions of special micro pigments produce an extremely concentrated colour density to create a firework of spectral colour. Prepare the vehicles surface with INVINCIBLE 9H PRIMER. This contains a special binder ingredient which crystallize after the polishing procedure to deliver a crisp and optically clear finish. Seal the paint with GLASSCOAT COSMIC 9H. A basic formulation consisting of silicon, titanium and carnauba. The micro pigments are in a special colour sphere (from which COSMIC derives its name) which acts as an additional layer of clear coat. Great website with useful info exactly where it's needed. Easy to order.